Brad Elman has been a Financial Representative with Northwestern Mutual since 1986. His areas of expertise include Wealth Accumulation and Preservation for Silicon Valley Executives. Below are a few of Brad’s professional accomplishments. Brad has been a member of the National Association of Insurance and Financial Advisors since 1986. 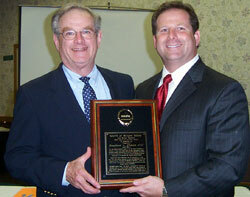 During 2005, Brad Elman chaired the NAIFA Silicon Valley’s Awards Committee. The committee determines the New Agent of the Year, the Jack Richter Award Winner and the Multi-Line Agent of the Year. Brad Elman, CLU®, Financial Representative, received NAIFA-Silicon Valley's highest honor, Advisor of the Year/Jack Richter Award in 2003. This prestigious career award recognizes the outstanding agent who has contributed to the financial services industry, developed into a true professional, is established as a substantial sales producer, and has been involved within his or her community. Brad's father, John Elman, JD, CLU®, ChFC® is the 1991 recipient of the award, and Brad and John are the second father/son team to receive this honor. Brad was instrumental in, and recognized for his contributions to the development of "Beyond one day at a time..." Northwestern Mutual Financial Network's brochure for the families of people with Special Needs. The brochure received the Insurance and Financial Communicators Association (IFCA) 2006 "Best of Show" award for Prospect/Customer Promotions (print). The CLU® designation is the undisputed professional credential for persons involved in the protection, accumulation, preservation and distribution of the economic values of human life. For Financial Representatives such as Brad Elman, as well as field managers, home office personnel and others involved in providing life insurance products to the public, the CLU® designation is the common bond for continuing growth and commitment to professionalism. Brad has been Nationally Published on Insurance and Planning Topics, served as an Employee Benefits Resource for CNET News Service, Personal Finance Resource for the Dow Jones Newswire/WallStreetJournal.com, and Personal Finance Resource, NBC11 News. He has been featured in: Morningstar Advisor.com and Kiplinger magazine, June 2001. Brad Elman is an internationally recognized speaker and author taking on a variety of leadership roles in financial services professional associations.